Salut! I finally completed my second book while en route to my new home, France! (I will tell you more soon ^.^) Unfortunately my days in Jamaica were so hectic with work that I started reading this book about 3 months ago and never got a chance to finish. My travels however which included one 4 hour coach ride, a 10 hour flight and 3 trains, provided me with ample time to complete my reading *twitches*. 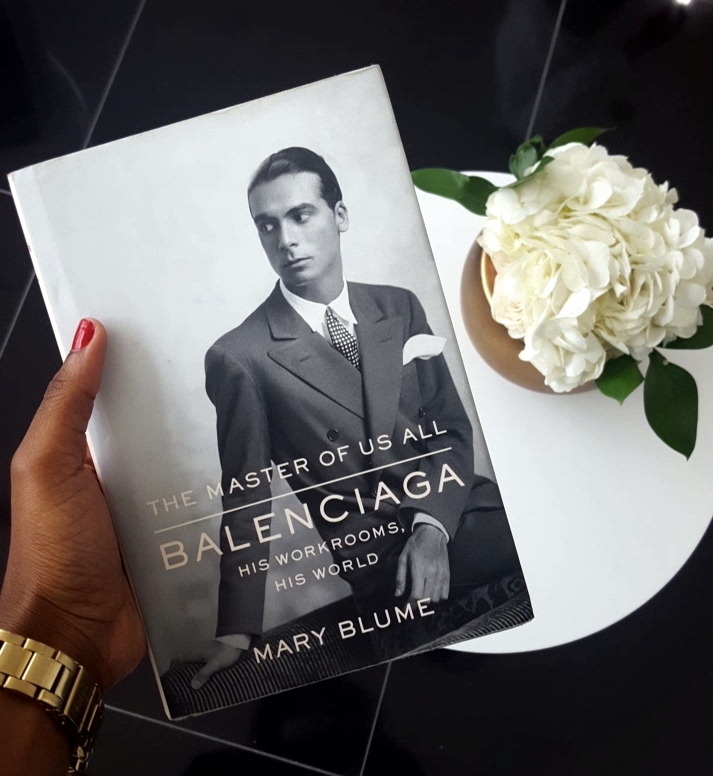 Blume's The Master of Us All offers us an "as close to accurate" biography of the designer's life, who by the way was perhaps one of the most illusive personalities of his time (no joke, he was actually referred to as the "monk of couture!") 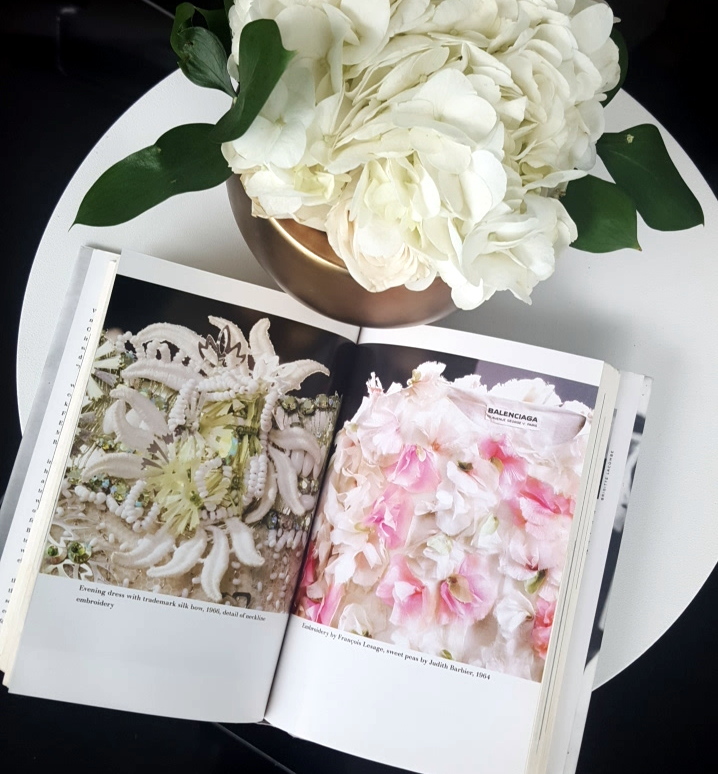 Through intriguing anecdotes provided largely by his long-time vendeuse, Florette and a few other acquaintance, Blume was able to dispel myths, otherwise confirm incidents as facts and uncover a few unknowns in her book. True Mastery Means Setting The Bar: It was not an exaggeration by Blume to declare, "He didn't follow the scene because he was the scene." Officially debuting in Paris in 1937, Balenciaga was constantly creating new ideas and reinventing the standard for fashion so that even two decades later in 1959 he had the highest net earning among couturiers. Balenciaga's career was defined by his unprecedented and iconic creations that paved the way for women's wear, and as a matter of factly, "All women benefited- and benefit still- from the principal achievement of his 1950s lines." He was lauded by his peers, Chanel (as shady as she was), Schiaparelli, Dior, Givenchy and Karl Lagerfeld among them as the greatest of his time. Why? Balenciaga never settled! 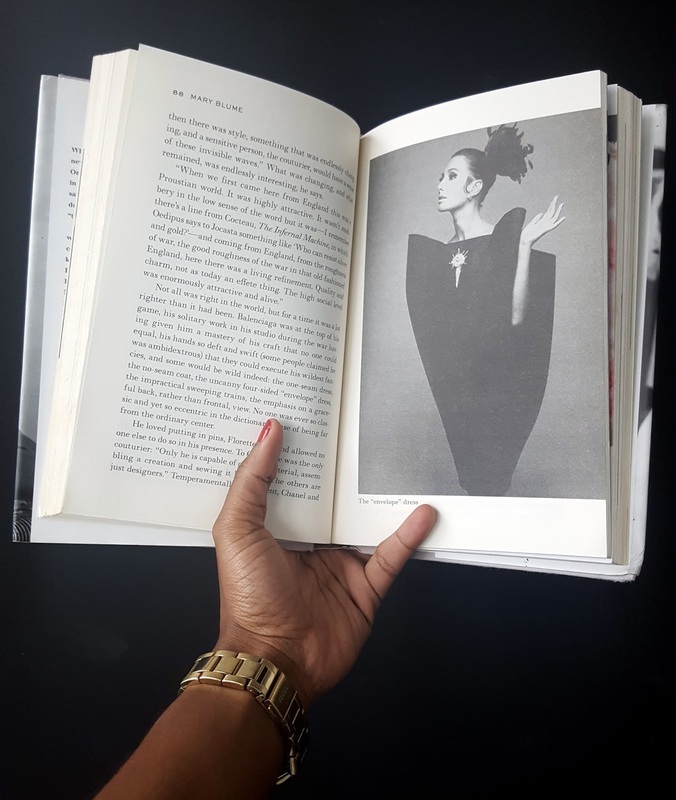 He always believed he could do better and spent his time, mostly in recluse, perfecting his lines and envisioning the "impossible" such as "....the one-seam dress, the no-seam coat, and the uncanny four-sided envelope dress." It is undeniable, "No one was ever so classic and yet so eccentric." Team Work Is Essential: One undeniable reason for the early success of Balenciaga's fashion house was the collaborative efforts of his team. He employed the right people to focus on his finances and client services to ensure he could focus on designing. 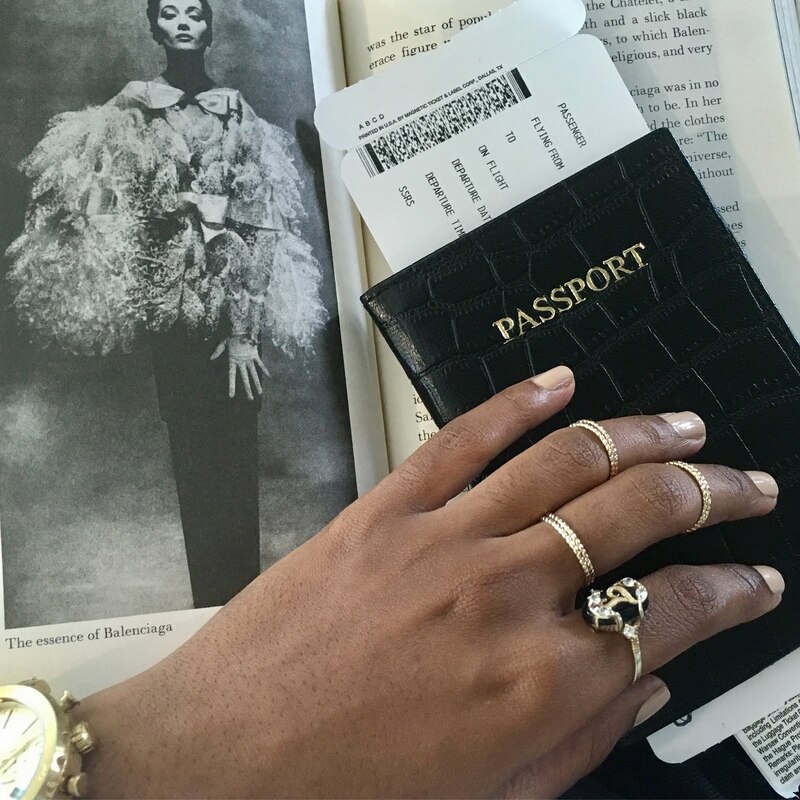 FYI entrepreneurs and future moguls: YOU SIMPLY CANNOT DO IT ALL ON YOUR OWN! If Balenciaga's story isn't convincing enough for you then take Christian Dior's for example. He was equally keen on hiring the right team who would help to amplify his 1947 debut so much so that by 1949 his brand provided 5% of France's export revenue (IN-SAAAANE!) i.e....team work makes the dream work! Mentorship is Invaluable:- During the early days of his career, Balenciaga formed a bond with French couturier named Madeline Vionnet (or simply Vionnet) which proved to be one of if not the most important relationships of his career. "She encouraged him to create rather than adapt other people's design," advise that would define everything he produced thenceforth. It is always good to draw on the wisdom of those who did it before us and later to share our learnings with those who come after us as Balenciaga did. He played an instrumental role in the rise of the house of Givenchy from providing the necessary funds for expansion to equipping the young designer with sound advise to move his brand forward. It is perhaps arguable that had it not been for this mentorship, Givenchy would not be the entity we know it to be today. So kids, don't be afraid to ask for help. No one knows it all! Authenticity Matters:- My mentor pretty much drilled this proverbial truth in my head; "to thine own self be true," something Balenciaga also lived by. While he was known for being one of the most innovative craftsmen during his time, at the core of his work was his Spanish essence. In spite of opening a House in Paris and having spent most of his professional career in France he never forgot his origins. In his mentorship this was one of the principles he urged young Givenchy to heed saying, "No, be natural, be simple, be honest, don't make complications." For Balenciaga, this meant using ones inherent talents to achieve success as opposed to trying to be something or someone else. LIKE, God forbid this had actually happened, when the Germans occupied France during the Second World War and their very audacious but ultimately failed attempt to move haute couture to Berlin. In protest, couturier Lucien Lelong who pretty much saved couture through his efforts, declared "Haute couture is French or it doesn't exists." Just imagine....actually- don't! Paris As The Fashion Capital of the World: From the onset Balenciaga used his better judgement to relocate to France to work on (and publicise) his trade. Though we are told he kept his Spanish ateliers open throughout they were never as significant (if I dare say so) as 10 Avenue George V. We are told that during the war Vogue and Harpers Bazaar frequently requested insight on the fashion landscape in Paris, because even in the face of turmoil French women were still expected to be indicative of all things luxe, and with reason. It was no surprise then that at the sound of liberty the world celebrated for France even though, "There were other cities that had suffered more or that were more strategic, but Paris mattered most," as Blume so simply puts it. The more things change, the more they remain the same as today we still look to Paris for inspiration. Indeed, 80 years after Balenciaga uprooted his life in Spain in hopes of "blooming in the Paris air" I find myself here (still haven't fully come to terms with my luck) with similar ambitions.